Replies: 137 (Who? ), Viewed: 80101 times. Still no installer - just unpack and run s4pe.exe. Bug reports, questions, and suggestions are welcome. #2 14th Aug 2016 at 4:31 PM Last edited by DevX : 14th Aug 2016 at 4:45 PM. maybe the new dds previewer isn't fully stable? Next time it happens could you post a screen grab of the error message? And if possible I'd like to know which resource caused it. Thanks! What did you do to create this package, or how did you get it? It looks like UI.package, but there's no filename, the file offsets are all 0xFFFFFFFF and the file sizes are all 0x00000000, which is what I'd expect in a new package with resources imported but that hasn't been saved, or possibly with a corrupted package. How did you import the UI.package, and to what? If you imported it to another package and didn't save before using it maybe that's causing your problem. The simplest thing would be to copy the UI.package to a work folder and use the copy; no need for importing. I downloaded it today, it works great and fast, but im curious about the serious "Trojan.M whatever" Warning and removal from Malwarebytes anti-malware in the file "build.exe". Harmful ? Got im scammed now ? :x just wondering if this might just me or is there a real danger behind it ? btw. i download it once again on a totaly safe VM and it happens there too. build.exe with trojan. It's not unusual for AVs to give false positives on executables, especially if they're not widely used and haven't been identified as safe. About all I can tell you is that my AV has no problem with it and I haven't seen any reports of problems from anyone else. #11 25th Aug 2016 at 7:31 AM Last edited by CmarNYC : 7th Sep 2016 at 12:05 PM. Edit: in future I think I can just remove Build.exe from the release - testing to make sure it's only used for making the build, not for using the program. Is there a way to get S4PE to export RLE files in DDS format when batch exporting? I'm trying to mass resized a hole lot of textures. With the current s4pe structure, I don't think so. It wouldn't be hard to make an external converter/extractor, though. I'll look at both possibilities. I would like to have a look in the code so I installed s4pe but where is the code? Can you direct me to where I can read about this type of code? I saw that you have done TS4 CAS-tools. Can it be used in this case? Yes after trying I did not think so either but maybe it can be added, thank you so much for whatever you come with up and for taking your time to do so! You're so awesome Ms. Byte! #17 6th Sep 2016 at 11:30 PM Last edited by CmarNYC : 7th Sep 2016 at 10:43 AM. There's a drop down button on the right to download the whole project in a zip. It's C# and set up as a Visual Studio project. TS4 CAS Tools uses some of the s4pi libraries. S4pi is the set of classes etc. that S3PE uses to handle resources and packages. The code includes both. CAS Tools doesn't do batch operations, if that's what you're asking. Edit: If you mean the code for the slider mods you linked to, I think they're Python scripts and bone and/or DMAP sliders. You could ask for more info in Modding Discussions. You won't be able to look at scripts with s4pe; they're in zip or ts4script (also zip archives AFAIK) files. Version 0.4.7 beta is released. The most notable change is support for the new version of CASP as of the 12/1/16 game patch. Any chance we could get a wrapper for _XML type 0x3c1d8799? It's used for the zonemodifier tuning. Getting this error on specific MLOD's... ClientFullBuild0 for EP3. My AV also flagged and deleted the S4PE exe file so I created an exclusion and redownloaded file before I continued. 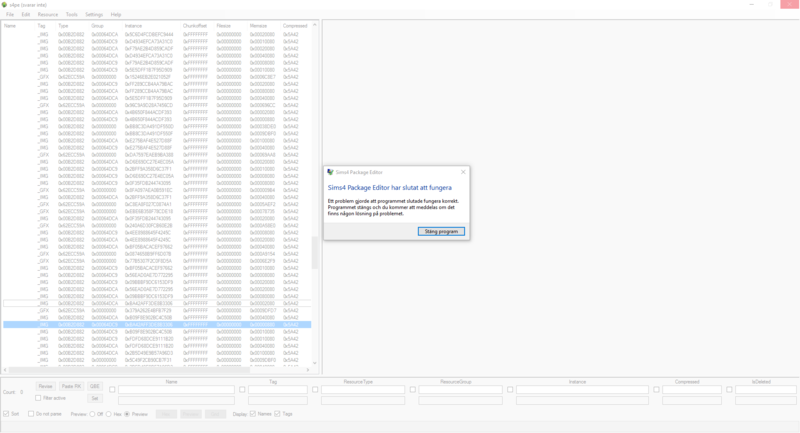 When I go to import the CLIP files for use in S4Studios I received the error message. I tried a method I found searching the net for a much earlier version with no luck. I am using 0.4.7 and tried it with 0.4.6 and same thing. Am missing something here and for the life of me I cannot figure it out. Please help, thank you! PS A heartfelt thanks to all who have made Sims4 Modding available for the rest of us! Keep it up! Mitch100degrees: Could you upload a few examples of the MLODs that are erroring? I suspect they're a new version but need to see them and test. You can extract them using Extract to File and Extract to Package and upload both, please. Dangals66: Sorry you had trouble with your AV. This happens sometimes since many AVs don't trust any executable they can't identify. The error you're getting typically happens when you extract s4pe with an extractor other than 7-zip. Please try again using 7-zip to extract the s4pe files. The link is in the info for the s4pe download. Bah! I figured it was something simple I was missing! It worked. Thanks very much! You ROCK!!! Attached 3 examples, each extracted to file and to package.